There are a number of reasons why a scheduled cesarean section (c-section) may be needed, including pregnancy problems, multiple births, and delivery complications. If there are medical reasons for a c-section, certain factors will be considered to determine the best time to do so. If this is your first or your second c-section, you will most likely be scheduled around the 39th week of gestation. While it is possible that you may go into early labor within this time frame, it is not considered a problem. In fact, some obstetricians actually prefer this. Delaying as long as possible provides your baby a longer gestation time and a typically healthier birth. Performing a c-section during contractions is no more or less difficult than doing so without contractions. If for any reason your doctor wants to avoid labor, the c-section may be scheduled earlier if it is deemed safe to do so. Whatever the scenario, it is important to delay the procedure long enough so that the baby's lungs and other vital organs are more able to function independently at birth. If you have had more than two prior c-sections, your doctor may recommend that you schedule your delivery closer to the 38th week. This is because the risks associated with a c-section increase with each subsequent procedure. A first (primary) c-section has a complication rate of between two percent and three percent, including the risk of infection, excessive bleeding, and bladder or intestinal injury. Each time an additional c-section is performed, the risk further increases. This is due, in part, to the accumulation of scar tissue at the incision site on the abdomen. Over time, this buildup of scars and adhesions can lead to an increased risk of placenta accreta (the abnormal attachment of the placenta to the uterine wall), uterine atony (where the uterine muscles are less capable of contracting), and uterine rupture. Even if there are pregnancy complications, every effort will be made to delay delivery until after 37 weeks so long as it does not cause harm to the mother and/or baby. Therefore, the scheduling of any c-section needs to be made in consultation with a qualified doctor able to communicate both the benefits and risks of the procedure. American College of Obstetricians and Gynecologists. "Patient Safety Checklist no. 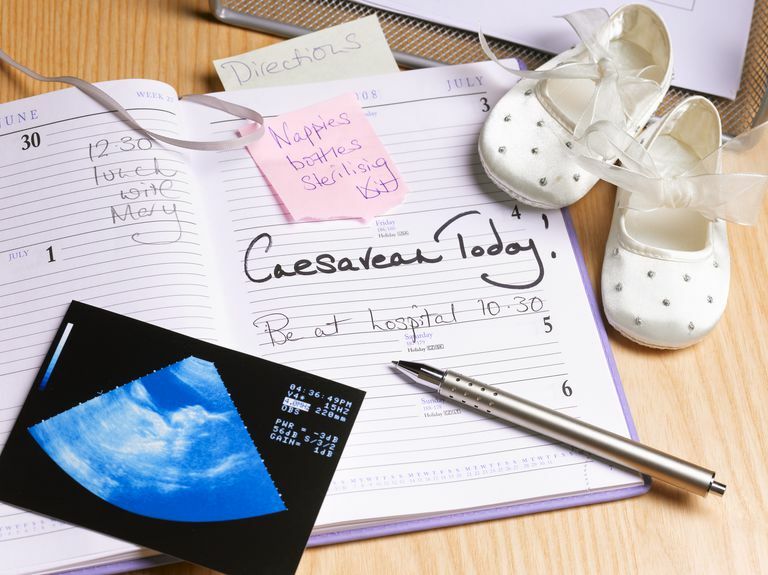 3: scheduling planned cesarean delivery." Obstet Gynecol. 2011;118(6):1469-70. DOI: 10.1097/AOG.0b013e31823ed20d. Glavind, J.; Henriksen, T.; Kindberg, S. et al. "Randomized trial of planned cesarean section prior to versus after 39 weeks: unscheduled deliveries and facility logistics—a secondary analysis." PLoS One. 2013; 8(12):e84744. DOI: 10.1371/journal.pone.0084744.